Having just harvested yet another three ‘Buffalo baskets’ (large, shallow baskets used for buffalo fodder) of delectable figs, I thought it was high time I shared some growing information about this incredibly versatile, wonderfully healthy, simple to grow, fast growing, fruit tree. Figs, small dark purple almost black figs, grow wild in many areas of Pakistan. Thriving and producing tons of fruit year after year, fig trees are especially common on forest edges and by rivers/streams from just north of Lahore right up to the Afghan border as well as in Swat, Hunza and Gilgit-Baltistan. These wild figs are harvested by local people — sometimes they are also sold at roadsides by enterprising children — who eat them as a seasonal, fresh treats but they can be made into all manner of preserves, plus, in suitable weather, be sun-dried for year round use as well. My own orchard garden in the Murree Hills is blessed with a sizable number of wild fig trees which fruit on and off from mid-June right through until the end of September. 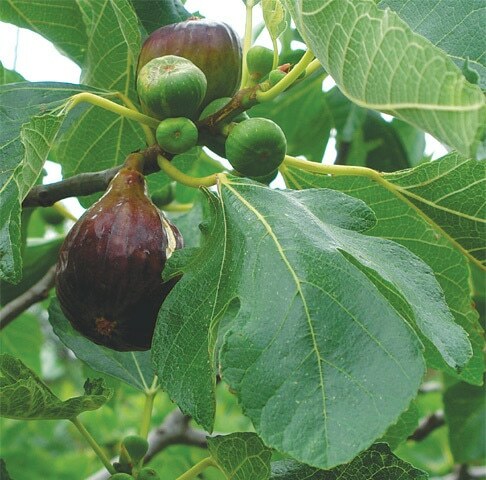 It was the unassisted success of these that prompted me to put in a few trees of ‘Turkey figs’ — these bear almost fist-sized fruit — obtained from nurseries in both Islamabad and Haripur. Fig trees — Turkey Figs and quite a few more varieties (there are literally hundreds of different varieties in existence) — are easy to grow throughout Pakistan and perform well in coastal regions where soil is sandy and water brackish. The only problem a friend in Karachi has had is that the ring-necked parakeets, along with other birds, adore the fresh fruit, making mass raids on them until she put up protective netting. Personally, as fig trees crop so heavily, I have an ‘agreement’ with the birds: they can feast on the figs in the tops of the trees as long as they leave those lower down, therefore easy to pick, for me and, surprisingly, it seems to work! Figs are not fussy about soil type as long as the ground is well drained: If their roots get waterlogged various fungal infections occur which can be lethal and have the capacity to kill even a mature fig tree very quickly. These usually strike the roots, spreading to the bark, branches and leaves. Different varieties of figs have differing virus/disease tolerance so be sure to select the one most suited to your specific location. Nursery people should, one sincerely hopes, be able to advise you on this. Young fig trees are best put in the ground during December/January — up to the end of March in hill and mountain areas — when they are dormant. Planting distances from tree to tree vary depending on the variety chosen: please ask your supplier for exact details. The width and depth of each planting hole is dependent on the size of the young tree being planted. The hole should have plenty of room in which you can, very carefully, spread out the fragile tree roots rather than trying to stuff them into a hole that is too small, and damaging them in the process. It is a good idea to put a bucketful of, preferably homemade, organic compost into the base of the planting hole, along with a boiled or burnt clean, beef knuckle bone (one with meat/fat/gristle/marrow traces would attract rodents) and a small handful of iron, not stainless steel, nails. The bone will provide the growing tree with calcium and other trace elements and the nails give iron for many years to come. Providing a tree with a long term food source, right in its roots, in this way, removes the need for regular feeding over the years to come and really helps trees get off to a good, strong, healthy start. If the young tree needs support — and most do — then firmly emplace a very strong wooden post in or immediately next to the planting hole before putting in the tree. Providing a support after planting the tree can result in serious damage to tender tree roots. After settling the new tree in its planting hole, carefully fill in around its roots with soil, watering it down now and then as you progress. Do not stamp the soil into place, this can damage the roots. Watering the soil in is much better. Keep the newly planted tree well watered for the first couple of weeks while it recovers from transplantation shock and then, depending on the weather of course, water twice a week for a month, reducing to just once a week afterwards and then, as the tree matures, watering is only needed in periods of excessive drought if, that is, the tree is fruiting at the time, otherwise no water is required for well-established fig trees. Most varieties of figs begin fruiting from the approximate age of 18 months to two years and will fruit annually thereafter. Pruning is not necessary unless there is a need to cut out dead or infected growth or to thin out overcrowded ‘internal’ branches that restrict sunlight from getting into the tree canopy. Any pruning should be done in the winter months when the tree is dormant. The white sap of fig trees can cause itchiness and burning if it comes into direct contact with your skin, as can contact with the leaves. Always wear gloves when pruning or when harvesting figs and always wash hands, face, feet and arms after working with fig trees to prevent any skin irritation from occurring. Figs are one of the most rewarding kinds of fruit tree to grow and I highly recommend that you give them a go. The rewards are tremendous.